Enjoying the delights of one of the capital's many parks has to be top of the list when it comes to free stuff to do in London. Stroll, slumber, skate or simply sunbathe, the choice is yours. Most are open from dusk to dawn and offer welcome respite from the hustle of the city. Stay in the centre of town or escape the clamour with a visit to Richmond or Bushy parks. All of London's parks are free to enter, we've highlighted some of our favourite green spaces below. Situated on the south side of the Thames, facing Chelsea, Battersea Park caters for everyone within its 200-acre space. Firstly, there's lots of water - a lake for boating, ponds for admiring the wildlife, and the Thames along one side for general gazing purposes. Then there's art - the Pump House Gallery (free admission) has regular exhibitions and there are many sculptures dotted around the park itself. Next comes sport - with all-weather pitches, tennis courts and a place to hire bicycles there's no excuse to be lazy. Children get a great deal with their own adventure playground and zoo, while a majestic Peace Pagoda bestows an air of calm and tranquillity to the typically action-packed surroundings. Wildlife thrives here with birds, animals and plants happily cohabiting within the grounds. Just north of the celebrated royal palace at Hampton Court, Bushy Park is the second largest of the Royal Parks. On the surface, the park appears simply to be a vast, rural expanse of exceptional wild beauty but of little historical significance. The lush grass, wooded copses and winding rivers do, however, hide an interesting past. A settlement for over 4000 years, a number of interesting items have been extracted from the park - archaeologists unearthed a Bronze Age burial mound and barrow here, the contents of which now reside in the British Museum. A keen eye for detail can make out the traces of medieval field boundaries, in existence before Henry VIII turned the area into one huge deer-hunting ground. More recently, during both World Wars, the park was used as agricultural land when Britain was suffering food shortages, and as the Supreme Headquarters of the Allied Expeditionary Force. The Longford River looks perfectly at ease in its surroundings, flowing leisurely through the park, but it is in truth a 13 mile artificial waterway, built in the time of Charles I to divert water from the River Colne to Hampton Court. History aside, these days Bushy Park is simply a wonderful place to get outside, walk away an afternoon and watch the sun slide spectacularly behind the horizon. The park's most notable feature is Chestnut Avenue; the mile long thoroughfare designed by Sir Christopher Wren is flanked on either side by majestic rows of horse chestnut trees and leads to the 17th century 'Diana' Fountain. Anglers can try their luck in the three ponds and there are facilities for a host of other sports including rugby, football, horse-riding and hockey. Formal plantations of trees mingle with wildlife conservation areas and big mounds of bracken hiding herds of deer. Combine a walk in the park with a visit to Hampton Court (though the walk is free you will have to pay an entry fee to the palace). Leave by the Lion Gate, stop off for a refreshing pint in the King's Arms pub just outside before you cross the road and enter the park via the Hampton Court Gate. 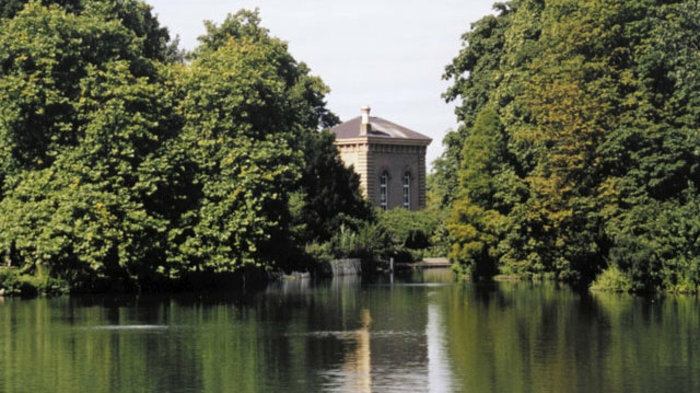 Walk towards Hampton Wick and take the train back from there. The wildest of London's parks, Hampstead Heath has fields to run in, long grass to roll in, woods to hide in and, most famously, ponds to swim in. In north London this is THE place to get back to nature. Strewn with picnickers, cyclists, families and the rest, the heath is large enough and has enough copses, hills and mounds that a quiet spot is never far away. 'Chronicles of Narnia' author, CS Lewis, lived near Hampstead Heath and local folklore asserts that it was its picturesque rises, ponds and woodland glades which inspired his mystical land. Parliament Hill is a beacon in the midst of this sprawling expanse of natural beauty. Its summit provides a view of the city almost in its entirety. Spot the famous dome of St Paul's juxtaposed by the ultra-modern Canary Wharf in the distance. This is the perfect kite-flying spot. Hampstead Heath is renowned as a rich conservation area and parts of it are designated as areas of scientific interest by English Nature. Hoards flock to the refreshing waters of the heath's celebrated ponds in the summer months whilst in the colder months it's more rewarding to while away an afternoon feeding the ducks or exploring the lush woodland, bogs, hedgerows and grassland. The heath doesn't look quite as rural as when Constable painted it, but nonetheless, it is as close to rural as you're going to get in a capital city. Pretty, petit Holland Park is the ideal location for those wanting to escape the clamour of the city but who don't want to travel too far out of the centre. Tucked away in one of London's most elegant districts, the park offers small, cosy grassy knolls, cooling woodland glades, wild ponds, pavilions, an open expanse for games and general frolicking, playgrounds for older and younger children and a cafe. Small, but perfectly formed, this lovely park is perfect for an intimate picnic or romantic stroll. There are beautiful woodland trails, manicured lawns and formal gardens, the Kyoto Japanese Garden with its resident Coi, and a fantastic ice cream stand in the middle. Opened in 1952, Holland Park used to be a private estate belonging to the Earl of Holland. During the 19th century Holland House attracted high profile visitors from various walks of life, from the politician, Lord Palmerston, to the poet, Lord Byron. The former ballroom of Holland House is now the stylish (and pricey) Belvedere restaurant, while the orangery and ice house host temporary exhibitions. In the summer open-air opera and theatre concerts are held in the grounds, you may have to pay for these but seeking out the pretty peacocks roaming around is free. Technically two different parks, Hyde Park and Kensington Gardens are in practical and historical terms one huge, merging expanse. Almost every kind of outdoor pursuit takes place within its 625 acres all year round. Horse-riding, rollerblading, swimming, boating, tennis, cycling, bowling and putting are just some of the formal activities catered for, while informal games of cricket, football, rugby and rounders regularly sprout up in the 'Sports Field' on the south side of the park. A number of famous London attractions are also housed within this central space. Hyde Park boasts the Speakers' Corner and the Serpentine lake, lido and art gallery, while Kensington Palace, the Italian Gardens, Peter Pan statue, Albert Memorial and Princess Diana Memorial Playground characterise Kensington Gardens. Both spaces have strong royal associations. In 1536, as part of the Dissolution of the Monasteries, Henry VIII recalled Hyde Park back from the monks of Westminster Abbey and began using it for hunting. In 1728, George II's wife Queen Caroline engineered the introduction of water to the park by channelling a stream to create the Long Water and Serpentine. Public use of the park was banned in the 18th century and then only introduced years later to a contingent of "respectably dressed" folk. The situation now couldn't be more different. From formally dressed horse-riders to scantily clad sunbathers, this area attracts and welcomes everyone. Its central location means it lures in folk from every walk of life and, as a result, is one of the most colourful, dynamic and fascinating green spaces in London. A full complement of events including free guided walks, concerts, workshops and entertainments complete the picture. 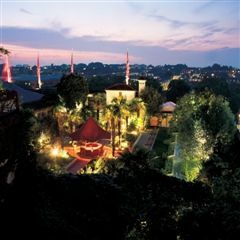 Now more a clubbing and "event" venue, these extraordinary Roof Gardens are still accessible to the general public during the day if there are no functions taking place (ring to check before your visit). Hidden on top of the old Derry and Toms (later Biba) department store, one hundred feet above Kensington High Street, visitors wishing to explore the gardens just need to go to the reception and sign in - entrance is through an ordinary looking door down a side road on Derry Street. Once you emerge out of the lifts a 1.5 acre expanse with spectacular views opens up to you. The gardens are divided up into three distinct areas; traditional English, formal Spanish and Tudor. The English garden, with its wild woodland theme, appears the most extraordinary, considering its position on top of an office block. Over 100 trees (all of which are under a preservation order), a stream and garden pond with flamingos and ducks combine to create a magical environment that defies its unique elevation. Fountains, vines and palm trees define the Moorish idyll, while the Tudor garden provides a delicate contrast with roses, wisteria, ivy and leafy arches. This really is one of London's secret treasures and worth the small effort required to arrange a visit. Another of London's spectacular John Nash creations, Regent's Park is a huge, thriving green expanse in the heart of the capital. Consisting of two circular areas (an Inner and Outer Circle) the park is bordered by stunning, stark white stucco terraced houses - also designed by royal architect, Nash. At one time a hunting ground for the ever-ebullient Henry VIII, the Prince Regent (later King George IV) commissioned Nash to transform the land in the early 19th century. Now most famously associated with London Zoo - positioned over on the north-east corner of the park - an open air theatre, ornate bandstand, large boating lake, huge mosque and 100-acre sports field add to its many attractions. The rest of its 410 acres consist of vast open parkland interspersed with formal, landscaped gardens. Dating back to the 1930s, Queen Mary's Gardens are still regularly and fastidiously tended, while the Rose Garden now bursts at the seams with over 30,000 flowers. Primrose Hill lies at the north of Regent's Park, merging and rising to a peak to offer fantastic views over Westminster and the City. A number of pretty eateries populate Regent's Park, while Primrose Hill is heaving with trendy cafes and bars. This is a great place for almost every kind of outdoor pursuit. If you're visiting the zoo or theatre (you'll have to pay for these), make sure you schedule in a couple of hours to explore this elegant, rural recreation area - and it won't cost you a thing. Only 30 minutes or so from central London, this is English countryside as you might imagine it depicted in a glossily illustrated Robin Hood story: mighty oaks, a thousand years old, dense forests, dinky copses, rolling hills, majestic fallow deer and burrowing rabbits. Covering almost 2500 acres, Richmond Park is the largest Royal Park in London. With such a large space it's hard to know where to start when visiting. A tall brick wall surrounds the entire park so you need to first work out which gate you are going to use to enter and then plan your route from there. The best way to enter is via Richmond Gate, heading first for King Henry's Mound. The park's position on the edge of town affords it some fantastic panoramas of the capital - King Henry VIII's Mound is the place to head for uninterrupted views all the way to St Paul's Cathedral. Wherever you choose to roam - via the ponds and Deer Park or circumventing the many lodges, make sure you end up at the Isabella Plantation. Heavily wooded and wholly organic, the Isabella Plantation bursts with massive mounds of azaleas, rhododendrons, camellias and magnolias and really is truly magical. Apart from a couple of roads running around the edge of the park (traffic is highly regulated and, for the most part, unassuming) the park has changed little since the reign of Charles I. Responsible for park's enclosure and the introduction of deer, Charles I sought sanctuary in Richmond during the plague. These days the park performs much the same function, offering a calming sanctuary from the pressures of city life. Enjoy. St James's Park with Green Park, Hyde Park and Kensington Gardens forms an unbroken line of greenery that stretches over three miles from the Houses of Parliament to Olympia. On the park's borders St James's Palace and the Queen's home Buckingham Palace stand proud, offering some stunning views from within its lush peacefulness in the heart of the city. A true retreat, it's hard to believe that St James's was a swampy watermeadow in centuries past. Now, rolling lawns stretch out around the lake, which is home to ducks, geese and pelicans. In the summer months visitors can catch a concert, loll in deckchairs (for a small fee) or dine alfresco with a picnic or on the terrace of the park's restaurant. From cheap budget accommodation to luxury 5 star hotels see our deals for hotels, including Hilton London Islington Hotel from 68% off.